Once our mandala is done, we have the problem of what to do with the rest of the page. We could do a square print, but if we want to go with standard size prints and not waste paper, then we have page to use up. I have worked with this in several ways. In some cases, I have moved the mandala to the top of the page and added text below it. We could keep adding rings to the mandala so that they fill the whole page. With my first calendula mandala, I added just one extra ring that ran off the page. Photoshop has all the data to recreate the whole ring, including the elements that don't show on the page; truly amazing technology. If you create extra rings expanding off the page, you could even shrink them down to fit if you wanted to for some applications. The idea is that you would fill the entire page with mandala that simply gets cut off at the sides. It can be a nice effect. I have seen people do it with their fractal mandalas. 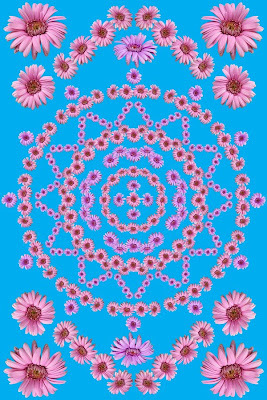 The solution I use the most is to add individual flowers or flower composites above and below the mandala in a symmetrical arrangement. It gives me a chance to give the viewer some large flower images to appreciate for their detail. I think it makes a nice balance to combine the pure beauty of the flower with the grace of the geometric mandala design. I'll let you be the judge.